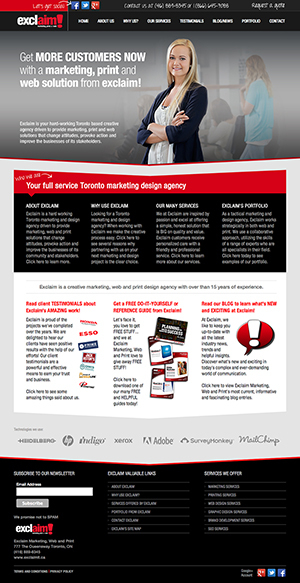 Toronto, Canada – March 1, 2014 – Redesigned! Redeveloped! Re-launched! Alex Stojkovic, the owner and “zoo-keeper” of Exclaim Marketing, Web and Print is proud to announce the re-launch of its new corporate website. The newly re-launched website can be found online at http://www.exclaimit.ca. Established in 2004, Exclaim Marketing, Web and Print is Toronto area’s leading provider of marketing, web design, graphic design, brand development and search engine optimization SEO services. The newly re-designed website is both stylish and more user-friendly than its previous site. Due largely to its overwhelming popularity, Exclaim will continue its tradition of creating various do-it-yourself reference guides. Small and medium-sized business in the greater Toronto area that visit http://www.exclaimit.ca will get a great opportunity to see the many ways Exclaim can help businesses get more customers. Whether it’s a marketing plan, website or a print project, Exclaim has a communications solution to meet small and medium-sized business budgetary needs. "I'm truly excited that Exclaim Marketing, Web and Print is Toronto area’s one-stop communication shop for marketing, web and print services. I give you my assurances that my organization will do its best to develop strategies to help small and medium-sized businesses get more customers. "says Alex of Exclaim. Visit Exclaim today and find out why you can’t afford not to work with them on your next marketing, web or print related project.